All new hires should be technically proficient and very comfortable with search engines, social networks and mobile apps. A new annual survey shows while media sales/executive managers are optimistic about big sales growth this year, the pressures of churn and corporate goals for 2016 are placing maximum stress on sales teams. Even excluding political sales in this hot election year, 84% forecast some revenue growth in 2016, with 43% expecting 6%+ growth. 54% of reps and 58% of mangers say it’s becoming harder to meet corporate expectations. The ramped up pressure is taking its toll on both management and their employees. 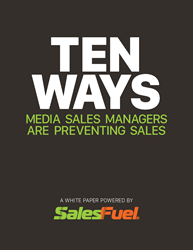 41% of media sales managers say it is getting harder to motive their sales staff. Likewise, 3 in 10 media sales reps also say it’s getting harder for them to get/stay motivated. Respondents expect digital revenue to account for an average of nearly 23% of total sales revenue by the end of 2016. Newspaper sales managers forecast the highest digital share at 33%. Media, please note if you would like enhanced data from the survey, customized to your audience and explained by SalesFuel CEO, C. Lee Smith, we are happy to work with your team. Just ask! SalesFuel provides more than 3,000 sales teams nationwide with “The Power to Sell Smarter” through its unique portfolio of sales tools, training and intelligence. This empowers sales teams to provide value-first to their accounts, stand out from their competition and attract a higher level of talent and clientele. SalesFuel is best known for its AdMall® product line for media sales and agency new business hunters and its AudienceSCAN® line of marketing research and customer purchase intent data. The company’s current core products also include the SalesFuel API as well as Gitomer Certified Sales Training. SalesFuel’s consulting partners can provide assistance with strategic planning, pricing models, compensation/incentive programs and digital marketing. Thought leadership is delivered free-of-charge through the firm’s many white papers and daily sales briefings at SalesFuel.com. SalesFuel also produces the MediaSalesToday.com e-publication, which is updated several times daily for media sales professionals across North America. For more information, visit our website at http://www.salesfuel.com.